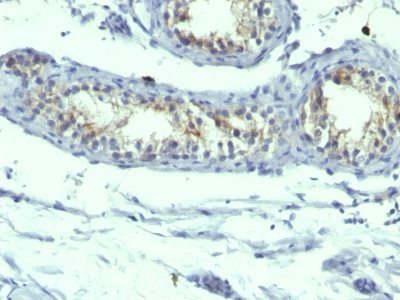 This antibody recognizes a protein of 70 kDa, identified as prolactin receptor. This antibody recognizes a protein of 70 kDa, identified as prolactin receptor. Prolactin is a pituitary hormone involved in the stimulation of milk production, salt and water regulation, growth, development and reproduction. The initial step in its action is the binding to a specific membrane receptor (prolactin receptor), which belongs to the superfamily of class 1 cytokine receptors. The function of the prolactin receptor is mediated, at least in part, by two families of signaling molecules: Janus kinases and signal transducers and activators of transcription. Catalog number key for antibody number 0744, Anti-Prolactin Receptor (B6.2 PRLR742) The prefix indicates conjugation, followed by the antibody number and size suffix. Breast Cancer Res Treat. 2011;128(1):31-40.